Coyote Blog » Blog Archive » Streambed on Mars? 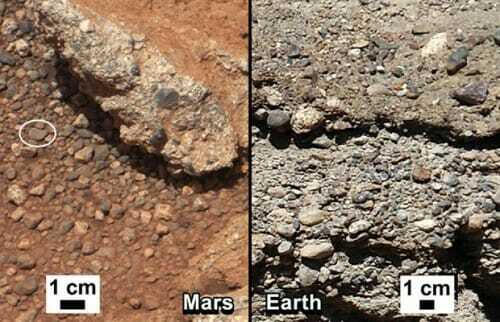 This is pretty cool -- what look like rounded river rocks and sedimentary conglomerates on Mars. During storms, the Martian atmosphere scours the surface with dust (much of which is iron oxide). Within a gully or canyon, the erosive effect on surface features can be similar to that of running water. There could be a chances of having little water in mars. The rocks and other particles get eroded with water only, there is no chances of turning rocks into soil with storms.